When Juniper's Pantry opened in Silksworth, Sunderland, it looked to be just another eatery serving bog standard sandwiches and tea. But this is one delicatessen with a difference. Curing meats, making salt in the cellar, and selling locally sourced produce, Juniper's Pantry is a cut above the rest, describing themselves as a "one stop delicatessen with traditional values,"and "practitioners of forgotten methods and bespoke services." It's like stepping into your grandma's cupboard: wooden panels covering the walls, fresh bread in baskets, jars of pickles, goose fat, jams, and an abundance of homemade cakes and pies piled high around the room. Part owner and Chef, David Gill, has worked in Michelin starred restaurants and casually says, "It's cheaper for us to buy in whole animals and cure them ourselves; it's basically just making ham." He learnt the trade working for three years at a top Swiss hotel kitchen, because, he said: "we were basically at the top of a mountain, the owner wanted us to learn to cure meats in case the electricity broke and we couldn't get it repaired when the weather was bad." But don't be fooled his nonchalance, though David may make it sounds easy, the results are something special: Cider and Wiltshire cured hams and slow roast salt beef, all made on the premise. Lots of trial and error has paid off, as the results are quality excellence. And it doesn't stop there. Juniper's make their own bread, game pies, pate's, and sausages. What they don't make they buy in locally from suppliers such as Doddington Dairy, makers of exceptional quality cheese, who are based in Northumberland. Juniper's family business has tapped into foods reminiscent of luxury banquets long forgotten, so no wonder their reputation is spreading faster than their foie gras and chicken liver parfait. David said: "It's been a busy few months, everything has happened so quickly, we loved the shop as soon as we saw it, and it only took six weeks to get the refurbishment finished and the shop open." You can eat in, or take out, and lots of people pop in for a luxury sandwich such as fiery bang bang chicken with vegetables and herbs. 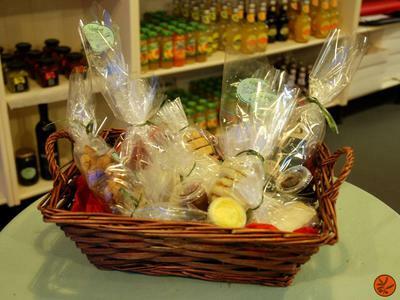 It's not just individual products they're selling though, as David says, "we sell hampers, which are perfect gifts," containing products such as Talisker whiskey marmalade, Vahlrona chocolate chip cookies, and nettle and garlic semi soft cheese. David said: "The reception from people has been brilliant. I've even had people ask if we cater for weddings and other events, so that's something we're looking to branch out into in the next year." The more staff I employ the more I can concentrate on opening another shop and on new projects,"
and thank goodness, the more Juniper's treats to go around the better. Why? "Juniper's Pantry - practitioners of forgotten cookery methods."